This ceramic cookie jar breaks the $50 limit – but really just by $1. You can purchase it here for $51.75. What a cutie! The day is finally here – Election Day. If you work in politics, you will know what I mean when I say – whew, it’s over. Many, many people have been working tirelessly to make America bigger and better than ever. So, loud hand clap for that blood, sweat and tears. It always amazes me to see hardworking Americans come out of the woodwork to cheer on their chosen candidate. Well, it is not a secret (have not kept it a secret on my blog that I vote red). At any rate – this is a celebratory/hopeful blog post – donning elephant accessories. Not only are they fashionable but highly appropriate this election cycle. See the set of items on Polyvore here. 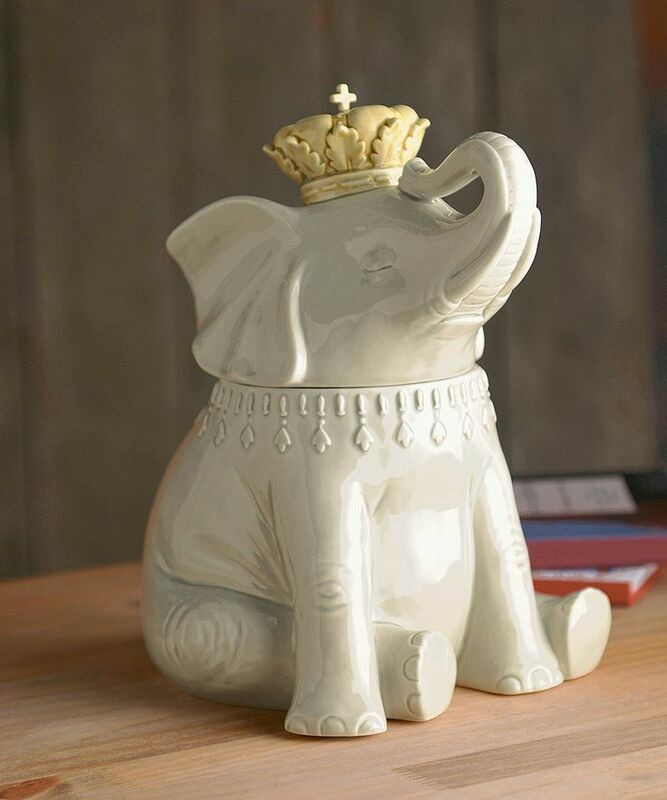 This link will give you the websites where you can purchase these elephant items. And everything on this list is $50 or less – hip, hip, hooray. Check out these cool items. Maybe a cute Christmas present for a loved one – or political junkie in your life? I don’t know about you but I am sporting my elephant gold necklace today (found in Eastern Market) and drinking coffee from my Jonathan Adler mug right now. Thumbprintz ‘Having a Ball II’ Elephant Graphic Print Tote ($25): Charm everyone you encounter when you’re carrying this Thumbprintz tote. This sweet tote features an elephant design and is made from polyester for durability and long-lived beauty for toting around your essentials. Fornash Elephant Earring ($28): Enamel elephant stud earrings. 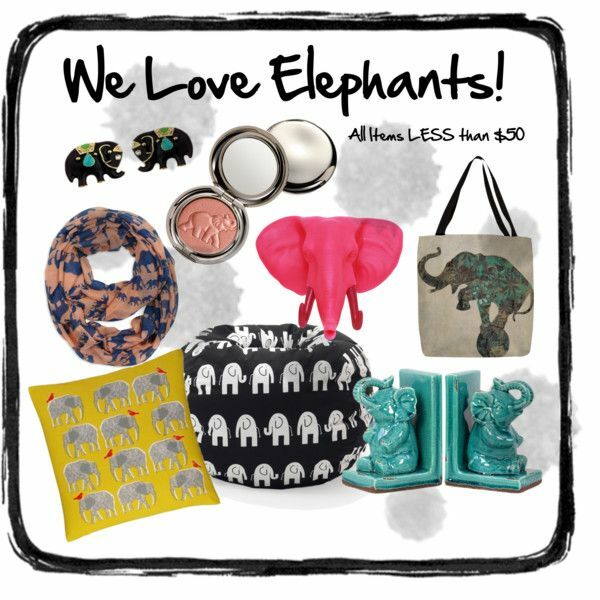 We love our exotic elephants! Our Elephant Earrings are adorable studs with plenty of intricate detail. Available in black and white. 3/4″ diameter Stud earring Surgical steel posts. Corciova Soft Animal Elephant Printed Infinity Loop Scarf ($12): Shop the latest styles of Corciova® Soft Animal Elephant Printed Infinity Loop Scarf (Pink) at Amazon Women’s Clothing Store. Free Shipping+ Free Return on eligible item. Chantecaille Fun Elephant Cheek Shade ($38): Chantecaille’s first refillable single compact. A soft apricot with a slight shimmer that offers the most subtly convincing blush of color-Micro-particle technology produces an ultra-light, ultra-fine powder-Goes on matte, blends smoothly, and adheres beautifully. – Goes on matte, blends smoothly, and adheres beautifully-Embossed with a limited-edition baby elephant to help raise funds and awareness for the David Sheldrick Wildlife Trust. BeanSack Classic Heavy-duty Twill / Elephants Print Bean Bag Chair ($43): Comfortable and durable,this Bean. Sack classic bean bag chair has a heavy-duty,black twill cover that decorated with white elephants. Filled with long-lasting polystyrene beans,this casual bean bag is the perfect spot for relaxation. Habitat Topsy Elephant Pattern Cushion ($19): Buy Habitat Topsy Elephant Pattern Cushion – Yellow at Argos.co.uk, visit Argos.co.uk to shop online for Cushions. Elephant Bookends in Turquoise ($45): These beautiful turquoise Buddhist-influenced Elephant Bookends are a unique and rich addition to your bookcase or mantel. In Buddhism, the elephant is seen as a source of strength, steadfastness, and responsibility. Adorn and inspire your room with these symbolic stoneware masterpieces. Zents Elephant Door Light ($18): Illuminate dark spaces with our motion censored LED Elephant Door Light. Perfect for lighting up those dark rooms, or used as a key stand. Lights up for approximately 20 seconds and automatically shuts off. Great gift idea. Elephant Door Light. Blue. LED Light. Magnetic. Closing note: If you think about it, send up prayers for this country today. The leaders we choose make a huge difference to this nation, her people and overall well-being.